a professional who possesses the technical competence through experience and related training. to provide for or supervise the management of trees and other woody plants in the residential. commercial. and public landscapes. An arborist, or (less commonly) arboriculturist, is a professional in the practice of arboriculture, which is the cultivation, management, and study of individual trees, shrubs, and vines, other perennial woody plants. 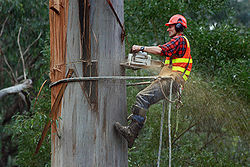 Arborists generally focus on the health and safety of individual plants and trees, rather than managing forests (the domains of forestry and silviculture) or harvesting wood. An arborist's scope of work is therefore distinct from that of either a forester or a logger, though the professions share much in common.